The Middle East boasts a few signature pita sandwiches: the vegan-friendly falafel; the shredded shawarma; and of course, kebabs of all sorts. Today is specifically about kofta kebab. The word kofta (or kefta) has its origins in Persian, and it means grounded or pounded. You can have meat kofta, seafood kofta or even a vegetarian kofta. 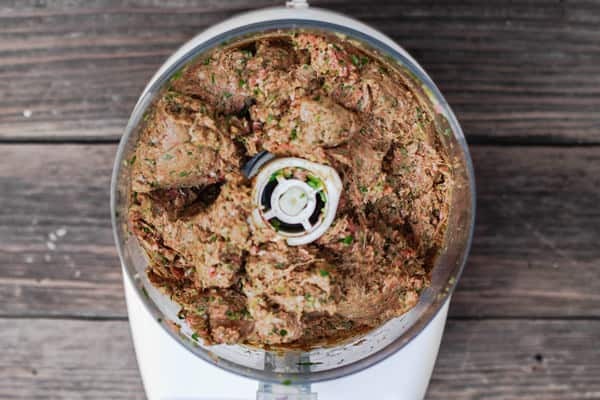 But today’s kofta kebab recipe is one of the more popular dishes in Egypt–a mixture of ground beef and lamb blended with onions, garlic, parsley and a few of my favorite Middle Eastern spices. My earliest memory of kofta kebab goes back to my elementary school days and a place called Tamimi, a family-owned restaurant near my hometown’s boardwalk. Tamimi was no fancy place, it was more of a “hut” with a couple of large grills lined with kebabs of all kinds. The word “busy” does not quite describe how wonderfully chaotic Tamimi was. For a good reason, though. Tamimi served the best kofta kebabs, and that’s where everyone wanted to be. 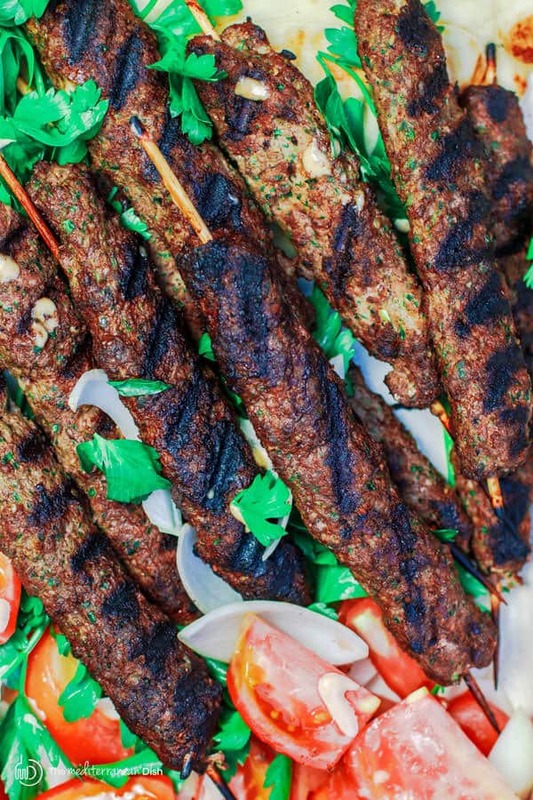 There are more than a dozen ways to prepare kofta kebab. 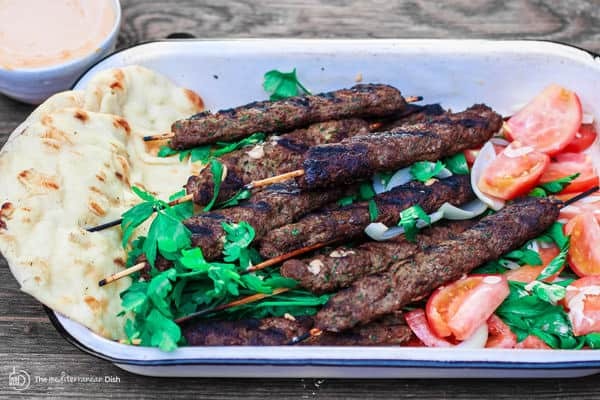 This kofta kabab recipe is easy and fairly authentic. It is my best rendition of Tamimi’s; and a tribute to the wonderful Mediterranean city I grew up in, Port Said, Egypt. There are many sides I like to serve along with kofta kebab. Here are a few: fattoush salad; chickpea salad with eggplant; or this easy fried eggplant dish. You can simply serve it on pita bread with tahini and some fresh tomatoes like the recipe suggests. 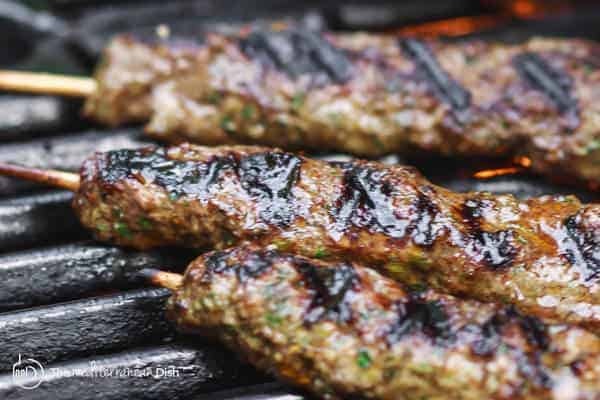 Place the kofta kebabs on the lightly oiled, heated gas grill. Grill on medium-high heat for 4 minutes on one side, turn over and grill for another 3-4 minutes. 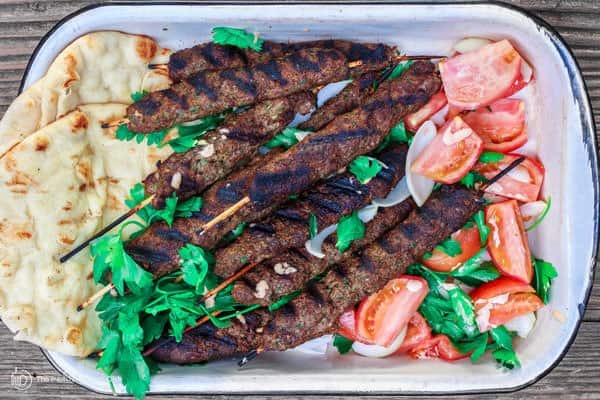 Serve the kofta kebabs immediately with pita bread, tahini and the fixings you prepared. See suggestions for sides and related recipes. For gluten free, omit the toasted bread. Recommended for this recipe our all-natural allspice; cardamom, sumac, nutmeg and paprika. SAVE! Try Ultimate Mediterranean Spice Bundle, or create your own 6-pack of all-natural and organic Mediterranean spices. 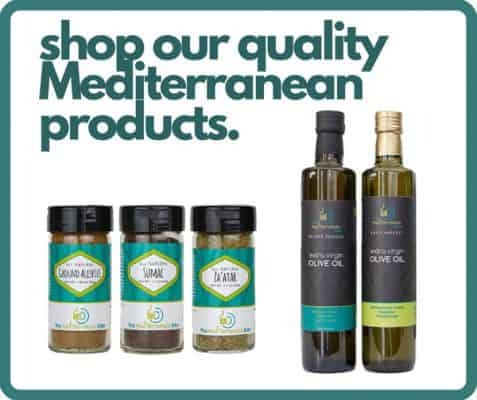 Visit The Mediterranean Dish shop for our Private Reserve and Early Harvest Greek Extra Virgin Olive Oils are from organically grown and processed Koreneiki olives. The BEST olive oil you will find! Soak 10 wooden skewers in water for about 1 hour; remove from the water when you are ready to begin. Lightly oil the grates of a gas grill and preheat it to medium high for about 20 minutes. Prepare the pita bread and the fixings. If you plan to, make the tahini sauce from this recipe (optional). 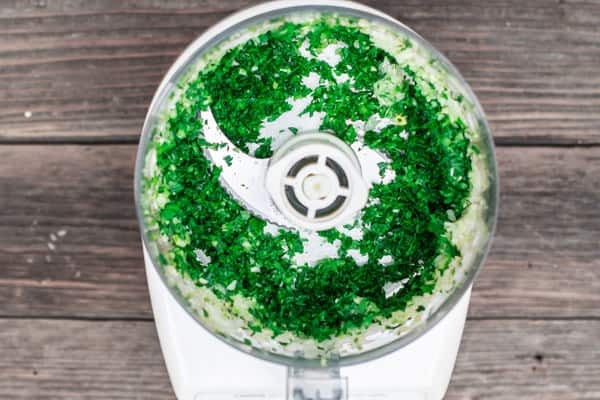 Remove the meat mixture from the food processor and place in a large bowl. Take a fistful portion of the meat mixture and mold it on a wooden skewer. Repeat the process until you have run out of meat. 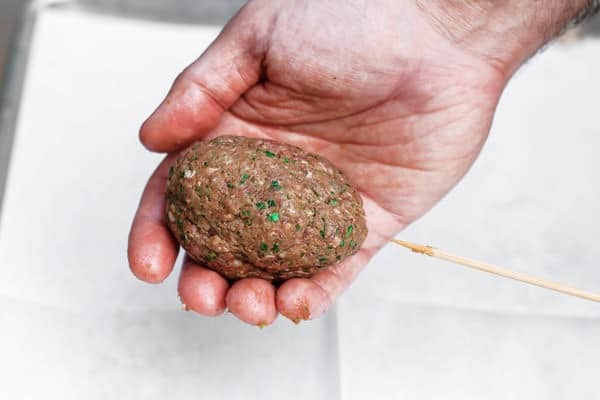 For best results, make sure each kofta kebab is about 1 inch in thickness. 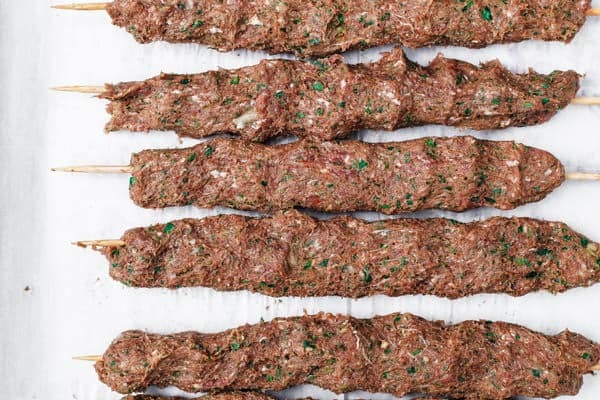 Lay the skewered kofta kebabs on a tray lined with parchment paper. 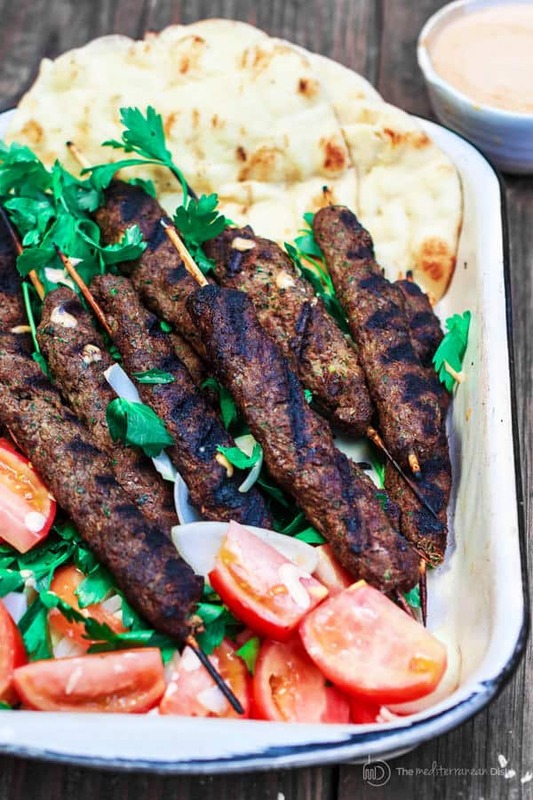 Serve the kofta kebabs immediately with pita bread, tahini and the fixings you prepared. I’ve mentioned some sides to serve with it up in the post, below are a few more with some related recipes you might like to try. Enjoy! Made this for 30+ people and they all loved it! Even the ones who don’t normally like this kind of food and the ones who don’t like lambmeat. I made this over the weekend along with your tahini sauce and your fried eggplant recipe (the one with the green peppers, tomatoes and sumac). Everything was wonderful, one of my favorite home meals in a long time. This site is amazing! Thank you so much, Rich! Makes my day to know the recipes are helpful to you. 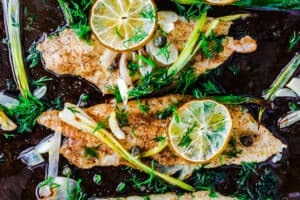 Can’t wait to try this recipe, but hoping to do it in the oven grill, how long do u think it should take? Perfect kafta 🙂 Tastes just like my mom makes (she was born and raised in Syria). 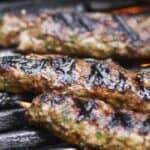 I’ve used this recipe for kafta burgers cooked in a skillet on the stove top and also baked it in the oven. The best thing is that you don’t need to measure everything perfectly and it always turns out delicious. Lisa, thanks so much! So glad to hear the recipes have been helpful to you. And I’m honored that this tastes like your mom’s kofta! 1. Why many recipes call for a mix of beef and lamb? Does the mix enhance the flavor? 2. The place where I reside doesnt stock any lamb meats. Will it be ok if I follow this recipe with just beef? 3. If I were to use beef, do I have to mix in a bit of fat into the mix? Thank you so much for sharing a great recipe. You can certainly make this very recipe using beef only. Lamb has a particular taste, and it does enhance the kofta, but it is just as good using beef only. And no, you don’t have to add more fat. Enjoy! Thanks for your recipe. Tonight I’ll make it. I was given green cardamom pods. To use them in this recipe they must be ground. Do I take the seeds out or grind the whole pod? I haven’t made this yet. Ican;t wait to try it. Harus cuba memang nampak menyelerakan! I would like to try this recipe tomorrow. I have a question however: Can I make the meat mixture the night before and store it in the refrigerator for the next day? I worry that letting it sit might end up in the mixture releasing water. 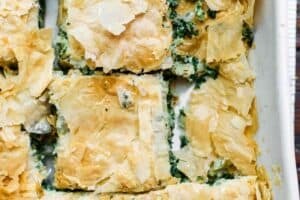 This recipe looks delicious…I hope I can honor my grandparents from Salonica! Any suggestions for a Veggie daughter of mine with Kepabs? Hi. This recipe looks delicious! I plan to make it this week. My only question is can these kebabs be frozen once cooked? I live alone and so the recipe would make too many for me to eat in one day! Aishah, you can freeze cooked kebabs and thaw over night in your fridge. Remove the skewers. To reheat, you can throw them in a skillet quick…may have to add a little liquid to make sure they don’t dry. Tonight was my first time making kofta and I am so happy this is the recipe I followed! The seasoning was a delicious pairing (and so fun to shop for☺️) with the onions, garlic, and parsley. The meat was tender and delicious. We were so fortunate to have warmer weather here today in Cleveland so we were able to grill. The char from he grill truly added another level of flavor which shouldn’t be skipped. We enjoyed this with your fattoush and it was a huge hit! We will definitely have this again and again. Thank you for this delicious recipe! I am so so glad to hear it! Thanks for giving this recipe a try! 1 does this recipe reheat well? We don’t have a grill and want to broil them ahead of time. 2 how much salt do you recommend? I also used 2 cups of parsley leaves and the paste was VERY green, not like the picture. Is this correct? Thank you SO MUCH for sharing the recipe and for providing the great instructions for preparation! Our family LOVES Mediterranean food and we never paused to think that it is something that we could cook for ourselves!! This recipe IS AWESOME! So flavorful. We cannot wait to try some of your others. Thanks again for sharing!! Thom, I am so so glad to hear it! 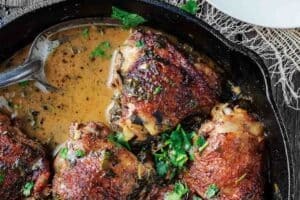 Thank you for giving this recipe a try, it’s a family favorite! And I can’t wait to hear what all you’ll be cooking here! Enjoy! Hi Aaron, I typically use Italian parsley. Thanks for the great question! Good recipe. I’d prefer less nutmeg. 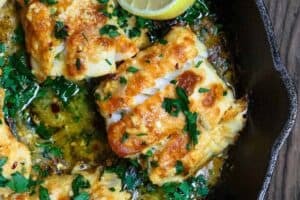 Wonderful site and recipes so easy to follow. Love it, love it! Thank you so much, Lorraine! I am honored. Glad to have you here! 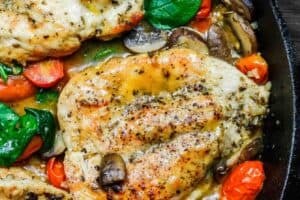 How can I make this without using the grill? Should I sear them in pan first?